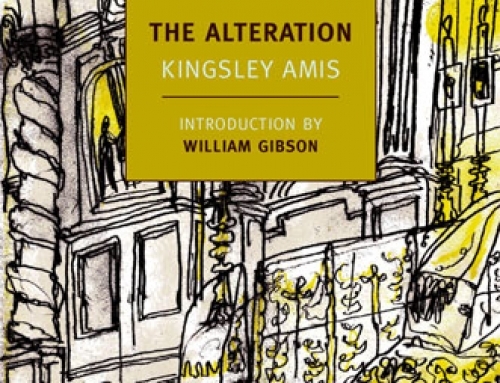 Yesterday, we looked at Kingsley Amis’s science-fiction/alternate history novel, The Alteration. 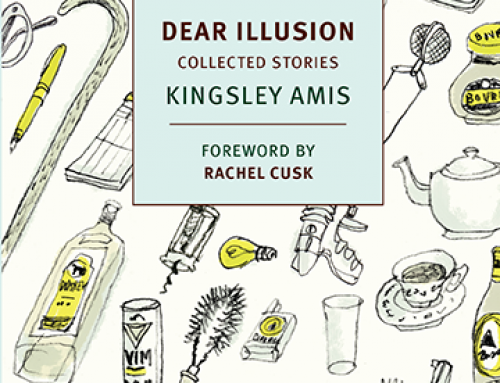 NYRB Classics also published a new edition of Kingsley Amis’s horror novel, The Green Man (1969), a novel that begins with comedy and ends with existential dread. Review copy courtesy of NYRB Classics. Life, for Maurice Allington, is a daily repetition of filling time, particularly with his favorite activities: drink and seduction. He owns The Green Man, an inn that has a charming back story of being haunted. Maurice lives at The Green Man with his second wife, his thirteen-year-old daughter (who was with his first wife when she was struck by a car and killed), and his seventy-nine-year-old father. When the story begins it is pleasantly like watching an old episode of Fawlty Towers. Maurice runs around the inn, slightly exasperated and self-centered, drinking and planning how he can seduce his doctor’s wife. The only bit of ghostliness we get here is the appearance of a red-haired woman on the upper landing, where most guests don’t go. She says nothing, and she’s gone before Maurice has a chance to wonder who she is. Business goes on as usual. Like a classic ghost story, then, The Green Man builds its tension slowly, with only a few slight hints that something is happening within the folds of the day-to-day. Maurice thinks little of it until he believes he sees the ghost of Thomas Underhill, the notorious ghost from the old stories of The Green Man. Underhill, a fellow at Cambridge, lived at the inn in the late 1600s. It’s possible he’s responsible for two unexplained deaths — all this intrigue! Nobody wants to see ghosts or think they see them or whatever you prefer. Can’t do you any good, even if it is all only in your mind — worse if it’s that, in fact. As I said, Dad, drop it. If there’s nothing in it there’s nothing in it. If there’s something in it, nobody with any sense would want to know. But Maurice knows what he saw, so he starts looking into Underhill, starting with the work of an old scholar named Thornton. Curiously, Thornton’s account tells about Underhill’s private journal, which is kept at Cambridge, but Thornton doesn’t tell his readers what’s there and seems even to dissuade them from seeking the journal. When Maurice goes to Cambridge, he finds the journal in the “anonymous” section, despite the fact that Thomas Underhill’s name is all of it. When he reads it, he knows why people haven’t exactly made it accessible. It’s a very fun ghost story with some fascinating undertones. The most interesting of these, for me, was Maurice’s growing understanding of why Underhill seems to be choosing him as an agent among the living. Maurice is too selfish to change, but he does rather despise himself. He feels guilty for the relationships he’s destroyed, though that doesn’t stop him from setting up a menage-a-trois with his wife and mistress. Of course, he might just have mistaken you for someone else, but if he really did recognize you, then there’s an obvious case for saying that he is in some sense or other existing in the twentieth century, having died physically in the seventeenth — existing to the extent of being able to perform at any rate one kind of action, involving intelligence, memory and so on: recognition. Maurice doesn’t believe in life after death. If a ghost appears, it should just be an image from the past, not some kind of consciousness from the past. For someone who almost looks forward to death as a means of escaping oneself, Underhill’s machinations in the twentieth century are not only terrifying because he’s a ghost, but they are also terrifying on an existential level. An exciting read. I’m rather enthused that for once it’s not a deluded narrator, which for me has been done so many times as now to be firmly in the realm of cliche (in fact, I think it passed into the realm of cliche literally decades ago, by the 1960s even). Oddly I think I’ve seen a tv adaptation of this. I wonder what happened to it? I suspect it never made it onto DVD. Anyway, it sounds rather good and given I actually have something of a taste for ghost stories it’s a definite must-read for me. It’d be an odd place to start with Kingsley Amis (well, sort of start, I’ve read his book on SF), but as a genre fan he’d probably appreciate it. It is on DVD! It’s an adaptation starring the rather marvellous Albert Finney. Can’t now say how good it was, but it might be of interest. “I’m rather enthused that for once it’s not a deluded narrator”. Hmm. Might have to check out that tv adaptation. Sounds like it could be entertaining.